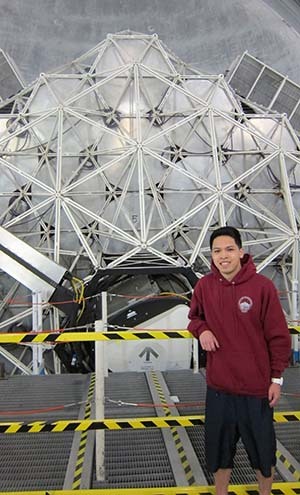 Richard Vo, a recent graduate of SJSU, had a discovery he made as an undergraduate published in a journal of astrophysics in Summer 2015. Recent San Jose State graduates Michael Sandoval and Richard Vo, with Assistant Professor Aaron Romanowsky, had their discovery of a “hypercompact cluster,” or a dense galaxy, published over the summer in The Astrophysical Journal Letters. The two students are graduates of the College of Science physics department. As undergraduate students, Sandoval and Vo were working with Romanowsky to search for new galaxies by poring through public data sets obtained from a number of major observatories including the Hubble Space Telescope. During this study, Vo discovered one galaxy, named M59-UCD3, that turned out to be the densest ever discovered. Shortly thereafter, Sandoval discovered an even denser object, which was so unusual that it was put in a class of its own, a “hypercompact cluster.” The students also went to Hawaii to participate in follow-up of their discoveries using the world’s largest telescope, Keck. Both have now gone on to graduate school to study astrophysics. Vo was also featured in an SJSU Today story in May 2014.